Amazon has huge collection of songs ready for quick download but after you pay some price. Hang on, now you can download part of mp3 songs collection without paying anything. There are over 772 mp3 songs listing that can be downloaded free – no strings attached. You can browse through list of songs available for free download and play preview them individually. Unfortunately there is no easy to download all 772 songs in one swap, you need to download them one by one. 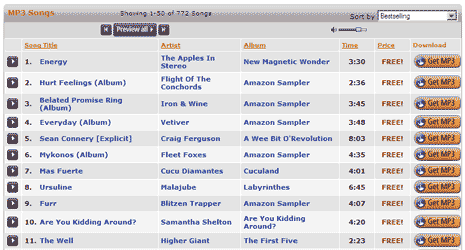 772 free mp3 songs at Amazon [via] (some relatively new), no complaints – right?